Given the typical cost of acquiring a new customer, it’s no surprise that repeat business is a real goldmine for any ecommerce retailer. And yet, many online retailers put very little effort into reactivating lapsed customers. They focus on increasing online traffic, spend money on achieving higher rankings and more search clicks, converting new visitors into leads, and much more. And completely ignore the simplest and most effective method of increasing their revenue – winning back old customers. But did you know that a repeat customer has a 60% – 70% chance of converting? Someone who has purchased from you 2 times is 9 times more likely to convert than a first-time shopper? So how do you ensure customers keep buying from you? Particularly, if they’ve been inactive for a very long time? It’s simple – you need to use what’s known as the winback email campaign. And in this post, I’ll teach you 5 dead easy email strategies to win back old customers. And then, I’ll show you examples of companies already using this strategy to reactivate lapsed customers. Ready? So, let’s get cracking! What is an Email Winback Campaign? A winback campaign is an email strategy aiming to reactivate a previous customer who hasn’t made a purchase in a certain number of days in order to, as the name suggests, win them back. A winback email typically offers a customer an incentive to buy from you again – a discount code or a gift. But let’s make something clear, the offer itself isn’t that important. What really matters in the winback strategy is HOW you offer those incentives. Before I show you 5 of the most common ways to do it, let’s see how winback emails actually perform in real life. The average win back email open rate varies between 30% – 50%. Win back emails achieve 15% – 30% click rate. And you can expect a conversion rate of 1% – 3% from a winback campaign. So, how do you use winback emails to reactivate lapsed customers? Here are a couple of ideas to try. I’m sure you already know everything there is about the powerful effect of discounts on Ecommerce customers. You know that a good deal could even convince someone to switch from a brand they’ve been loyal to for years. But did you know that discounts work even better if you set an expiry date for them? Urgency aims to make potential buyers think differently about the decision they need to make, be it to buy or sign up for a deal. It helps suspend their natural behavior, like procrastination, and motivates them to act on impulse. And you can use this strategy in a win back campaign too. JOY, an online clothing retailer, use this strategy beautifully by allowing only a week for a person to make the call about availing of the winback voucher. The previous method relied on sending just a single discount to reactivate lapsed customers. And effective as it is, it relies on offering a hefty discount right away. The problem? You allow every old customer to buy at a greatly reduced price, regardless of the actual discount that would be enough to bring them back. In other words, you discount too much. The solution – use discount ladders. In other words, you start off with a smaller discount, and increase it with every email as the likelihood of a person to never come back to the store also increases. For example, you offer a customer who hasn’t purchased anything from you in 30 days a 10% discount. If they still haven’t bought in another 30 days, you double the offer. And then, ramp it up again, if they still haven’t purchased in another 30 days. At first, they are highly engaged with you. They visit the site, buy, and share your stuff online. But in time, they move into a more apathetic phase where their care for your brand begins to wane. Finally, they enter the detached stage, where they no longer care about your store. And as their likelihood to come back to your store decreases, you can offer a higher discount, knowing that fewer customers will de facto take you up on it (meaning lower losses due to the offer for you). I admit, the danger with discount ladders is that once a customer realizes what you’re doing, they might begin deliberately waiting for a higher discount to arrive. So, if you’re not 100% comfortable with using this strategy, consider sending the same discount but time it to every phase of customer engagement with your store. Email them a modest discount after they’ve been inactive for, say, 30 days. Then repeat it if they haven’t purchased anything in 75 days, and finally send the discount once again if they still haven’t come back after 90 days. 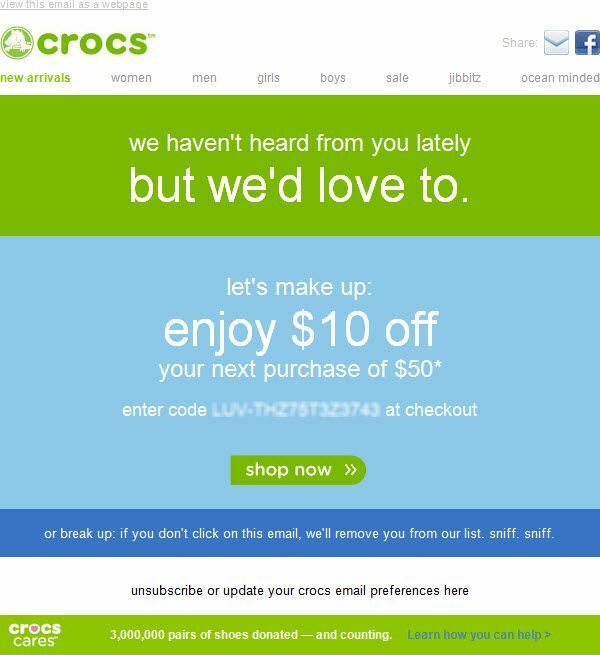 Instead of discounting the purchase, you can add something extra to a customer’s next order. After all, nothing says “come back” better than a freebie, right? By offering an add-on, bonus or just a free gift, you can incentivize a person to come back to your store and start buying from you again. 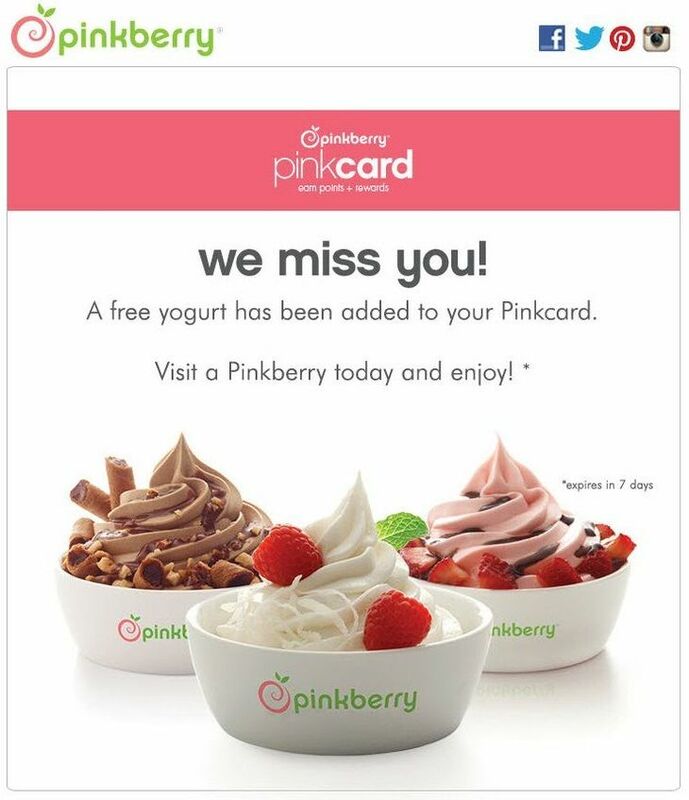 Pinkberry, for example, adds a free yogurt to a person’s account once they’ve been inactive buying from them for a while. If you haven’t been actively trying to re-engage lapsed customers, then you probably have a couple of years’ sales data to go through. Many of these customers may have been inactive for months or even years. Sending them a discount or a gift might not bring many results. After all, by now they may have even forgotten about you. Luckily, there’s a simple way to reactivate them, although you need to do it in 2 steps. First, you need to request re-permission to email them. As said, many of these customers may have already forgotten about you. Sending them an offer out of the blue will most likely result in them marking your emails as spam. So, before you do anything else, ask their re-permission to email them offers. By poking a little fun here, the company asks a long-time lapsed customer whether they still want to receive their emails. It’s a gentle and unobtrusive way to re-engage a person with the list, get back on their radar, and get permission to start emailing them the winback offers.